There are three flavors that I gravitate towards all year long… Coconut, lemon, and pumpkin! I have a crazy pumpkin addiction. I try to limit my pumpkin baking to the fall and winter months, but every now and again one sneaks into our weekly menu during the summer. Since it technically isn’t fall yet, I’m going to break my rule and post this amazing pumpkin cinnamon rolls recipe! I have a feeling these will be making an appearance around Halloween. Maybe even again around Thanksgiving. My only critique would have to be that they do not taste amazing the next day. You need to eat these fresh and right out of the oven smothered in the cream cheese frosting. My four year old does not agree and insisted that I individually freeze the leftovers for quick breakfasts throughout the school year. If you want to go this route, simply place in a microwave for a few seconds to heat them up and you are good to go! Combine 1-1/2 cups of the flour and yeast in to bowel of an electric mixer. In a separate bowl mix together the brown sugar and cinnamon. Set aside. In a small saucepan, stir together the pumpkin, milk, sugar, 2 tablespoons of butter, and salt. Heat to 120 degrees F. Pour into your flour mixture with the egg. Mix until just combined. Stir in the remaining flour until you get a stiff like dough. Switch to your dough hook and mix for an additional three minutes. Spray cooking spray in a medium sized bowel. Place your dough in the bowl and turn once to grease the top. Cover and rise until double in size. Turn out onto a floured surface and roll into a 12 x 10 rectangle. 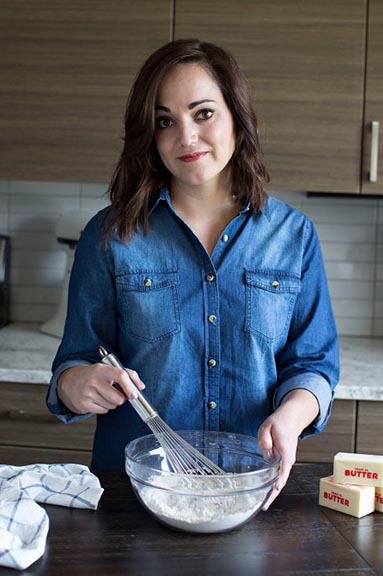 Melt the remaining butter and brush onto your dough. Evenly sprinkle your brown sugar mixture and roll starting with the longer side. Cut into 12 pieces. Place in a 9x13 pan, cover, and allow to rise until double. Preheat the oven to 375 degrees and bake for 20 minutes, or until lightly golden in color. Cream together the cream cheese, butter, and spice. Slowly stir in the powdered sugar and vanilla. Add milk to thin to your desired consistency. Yum! 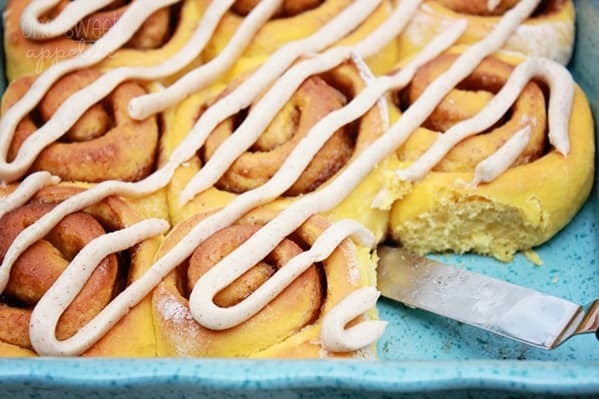 I have been really wanting to try different flavors of cinnamon rolls and this looks like a great one to start with! 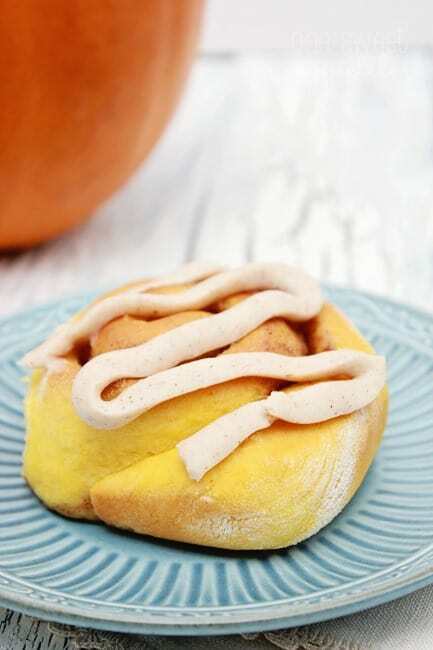 I’m not normally a pumpkin fan, but I’m thinking if its mixed with a cinnamon roll, I could probably enjoy it!!! Yuuum! 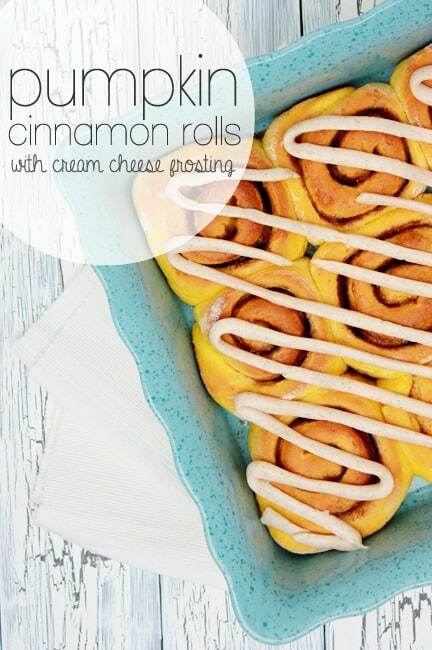 These are definitely going on my fall baking list. Pinned! Look so yummy! And your new look is amazing!! Thanks Kylie! It’s been a process. I’m sure the girl that is helping me design it is ready to pull my hair out. Oh yum – these look delish! Don’t mind if I do! I just want to reach through the screen and grab one.